Oh man….these are delicious! I had found this recipe a long time ago and have made it several times. But over the course of each time I changed bits and parts because it wasn’t good enough. lol. I feel like I have completed my transformation and it tastes how I want it to! Basically, the whole recipe is different though. There is pretty much no fat and minimal sugar. Fantastic, eh?! 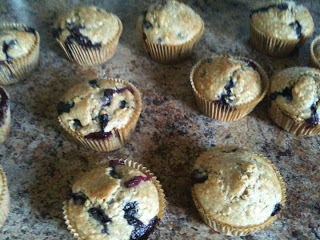 I also used organic berries that I picked from a farm and organic oats from a local organic store. So here it is…enjoy! 1. Preheat oven to 425 degrees. Spray muffin tins or use liners. 2. In bowl, combine flour, oats, brown sugar, baking powder and cinnamon. Stir in milk, egg, yogurt, and vanilla. Mix well. 4. Spoon into muffin cups, 2/3 full. 5. Bake about 25 minutes or until lightly brown. Tell me if you make them and how you like them! Next PostWhat’s for Dinner tonight (and dessert)?